Truth-seeker, honest, probing, popular, amiable, broad-minded and creative. Changing, hesitant, eccentric and inefficient. Truth-seeker, honest, probing, popular, amiable, broad-minded, creative, changing, hesitant, eccentric and inefficient. Your kisses are wet and messy, and you tend to keep your eyes open. 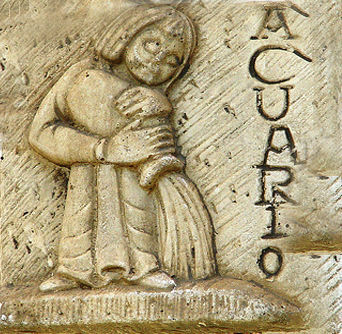 Aquarius is the sign of the Inventor. Aquarians do well in any out of the ordinary professions such as land, building, real estate etc. Aquarians also make wonderful doctors, psychiatrists, psychologists, writers, painters, musicians, commentators, actors etc. Aquarians in choosing a career consider professions where inventiveness, originality and independence are fully expressed. Aquarians achieve scientific degrees and hence should continuously work in their careers. Many do well in theatre, films and literature. Aquarius examines and probes too much for the comfort of the lover. Aquarians can leave a trail of broken hearts. The emotions are sensuous. Marriage is not cut out for Aquarians. Interference and possessiveness could ruin your marriage. Aquarius may outgrow marriage. The mate may feel that the Aquarian does not care enough. In total, there have been 25171 visitors (100508 hits) on this page!